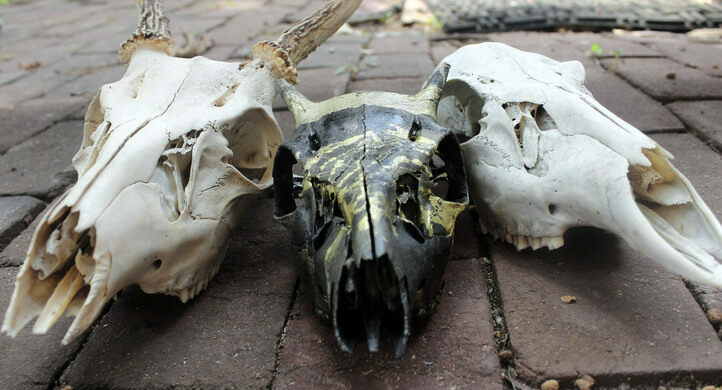 Come paint ethically sourced deer skulls and take a peek inside the world of bone collectors. "Vulture Culture" is an increasingly popular hobby where people ethically collect animal bones, pelts, and taxidermy and—often—create art with them. Join us at the Colony Club as we all become honorary members of "Vulture Culture" and create individual painted works of art out of deer skulls salvaged from an old hunter dump. We will use a unique technique called “hydro dipping,” where attendees will paint the skull with a psychedelic swirl. While the skulls dry, we will learn from Kristin Hugo, a member of "Vulture Culture" and author of the blog Strange Biology, about how to properly source, process and study animals remains. Then, Haley McKey from the non-profit organization Defenders of Wildlife will join us to talk about what's ethical and what isn't and how we can all better protect our furry and feathered friends from exploitation. Your ticket includes a deer skull to paint and keep, all art supplies and a donation to Defenders of Wildlife. Please dress ready to paint. Art can get messy! The subject matter is a bit graphic and may not be appropriate for kids under 15. Coffee, beverages and snacks are available for purchase at Colony Club.